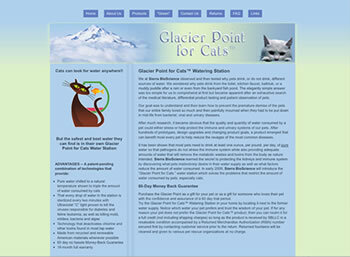 Sierra BioScience LLC came to us in 2008 with a request to build a site appealing to cat owners to feature their Glacier Point for Cats Water Station product for owners interested in providing pure water for their cats. We did that, and the site and the business grew. In 2015, the site owner decided to move to another development firm to further grow the business. If you're just starting out, ask how we can help you grow your business.